"My students and their parents love the program. As a veteran teacher (30+years) this is the best program in science that demonstrates difficult concepts in an engaging manner so that students retain information. We use the active board in the classroom (Tues. - Fri.) and we work in the computer lab with the computer teacher (Mon.) to further implement this program. It totally covers the sixth grade curriculum and the students look forward to science. Parents are very impressed with the program and expressed their appreciation with a standing ovation at back-to-school night. Welcome! 3D-VIEW [Virtual Interactive Environmental Worlds] is packed with proven, standards-based lessons and a DvD of 3D content for Earth Systems Science. You receive 3D-VIEW units in 1) Air; 2) Life; 3) Water; 4) Land and 5) Earth Systems. 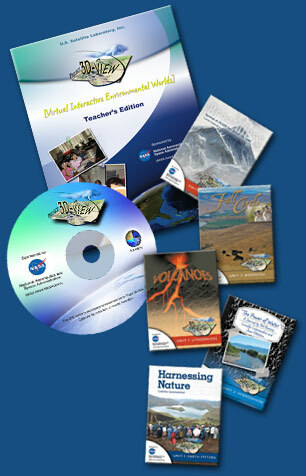 3D-VIEW is a comprehensive, interdisciplinary Earth Science curriculum for students in Grades 5-8. Use stimulus monies for what it was intended. The STEM-based curriculum integrates middle school science concepts and uses technology as a core component. It is balanced with hands-on activities. Teachers regularly facilitate lessons with a computer and projector. Using the simplest of interfaces, students explore, create, manipulate and navigate 3D stereo VIEWs, scenes and animations. Students use authentic NASA mission data as they explore and construct knowledge about the Earth's spheres: Atmosphere, Biosphere, Hydrosphere and Lithosphere. The last unit, Earth Systems, explores 'cycles' and 'energy' and integrates human impacts on the Earth System. It goes above and beyond standards; students build their own web pages on environmental 'hot topics'. The culminating activity engages students to build their Sustainable School. Enroll in Training. Click here for current online offerings and registration information. This link takes you to NASA Endeavor. Click "Courses". Call 1 (800) 707-8519 for registration assistance. Order materials. Click here for samples and pricing. 3D-VIEW includes support and additional future programming opportunities. The program is research-based and teaches students science content using a constructivist and visual approach with scientific inquiry. The program's aim is to increase student achievement in middle school science by enabling students to truly understand dozens of abstract concepts such as seasons, photosynthesis, and plate tectonics. A 2005 study conducted by collaborating partner Stanford University revealed that 3D visualizations increased student understanding of the mechanisms of plate tectonics. A 2009 study saw over 70% of students in grade 5 and 6 score 'advanced' or achieve 'mastery' on grade 8 science questions. Each 3D-VIEW unit stands alone and fits seamlessly into local curricula. It is standards-based, covering topics already taught at this level. In addition to the focus on science and technology, Project 3D-VIEW includes formal literacy components. Each unit includes a fiction or nonfiction Reader with suggested literacy activities and mathematics activities built on science content, giving a practical context to math concepts. These components are meant to enhance literacy in the science content area, mathematics achievement and cross-curricular connections. © 2010 U.S. Satellite Laboratory, Inc.
Click here to find out more about U.S. Satellite Laboratory, Inc. and its pipeline of education programs.